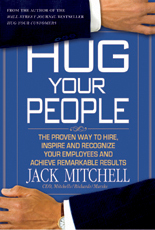 In Hug Your Customers, Jack Mitchell showed business readers how to keep their customers happy -- and their profits booming. In Hug Your People, he elaborates on his big secret: hiring, motivating and keeping your biggest asset, great employees! Hug Your People is filled with real stories about real people. Jack offers his principles on "hugging" your associates -- whether they are the sales team, the cleaning staff, the delivery people, the backroom financial wizards, the marketing and advertising departments, or outsourced staff. Hug Your People is just what today's employees and managers need.